Reuben’s parents are in town so we spent the weekend eating our favorite foods and seeing a beach or two. Whenever we go to the coast, I’m always reminded of how nice it is to live in California. Then the moment we start driving back to the city, I immediately feel the desire to move back to Ohio. On Saturday there was a little Harvest Moon Festival on Clement St. in our neighborhood and it was the sweetest thing! It was small and not trendy at all, but it was perfect and perfectly Asian. There were a lot of tents focused on public service (which oddly felt Asian?) and a few crappy craft stalls., BUT there was a tent selling Dragon Beard Candy and warm mochi covered with peanuts and sesame seeds. OMGGGGG so tasty! That tent alone made the whole event worth it. I loved how the whole community was out on a sunny afternoon enjoying the neighborhood and buying mooncakes! If you haven’t had a mooncake before, this is definitely the time to pick one up! The festival also made for prime dumpling watching. That’s how Reuben and I refer to creeping on cute asian babies. DID SOMEONE SAY DUMPLING? 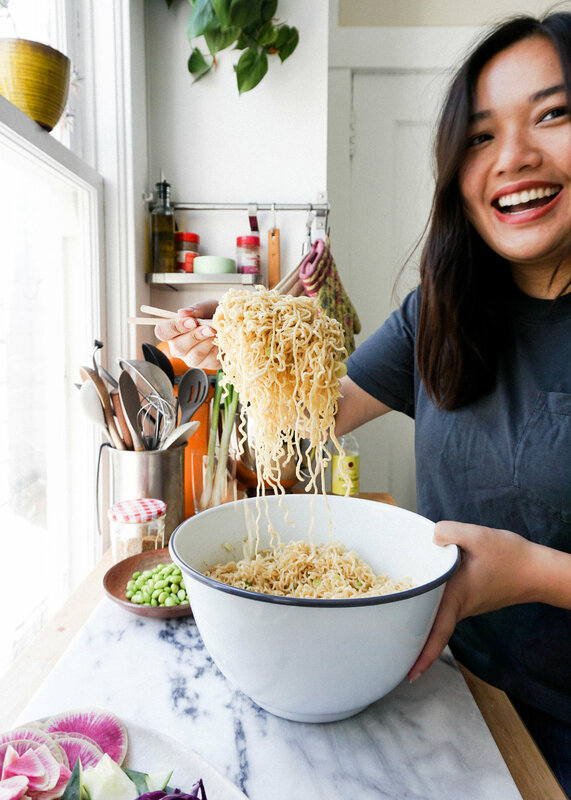 The last time I shared a dumpling recipe was in MAY! May! That is waaaaay too long to go without dumplings. Shen Jian Bao are sort of a cross between a dumpling and a bun. I would describe them as pan-fried steamed buns. The dough is more like a traditional dumpling dough, but it has the addition of yeast. They are seared first and then steamed to get their characteristic crispy bottoms. So they are sort of like potsticker-ed buns. BUMPLINGS. I sort of like the sound of that. I’ve been wanting to make a cheeseburger dumpling/bun for forever! I thought I would make them in the form of a potstickers but shen jian bao seemed to make more sense because I like the concept of the bun encapsulating the burger patty inside. The filling is comprised of juicy tender ground beef, caramelized onions, extra sharp cheddar for that little bite, and a bit of ketchup for tang. The dough is soft and fluffy with a nice crisp from the pan fried bottom. These are essentially mini cheeseburger sliders, but made cuter via dumpling format! To make your dough, combine flour, yeast, sugar, and salt in a medium bowl. Whisk to combine. Make a well in the center and slowly pour in your water while gradually mixing the flour in the water with your other hand. Once all the water has been mixed in, knead with your hands for 5 minutes until you have a smooth and elastic dough. Place dough in a clean bowl and cover with a wet kitchen towel. Allow to rest for 1 hour in a warm place. While your dough is resting, make your filling. Add oil to a skillet and heat over medium heat. Add diced onions and cook until softened and slightly caramelized. Should take about 10 minutes over medium heat. Remove onions from heat and place in a small bowl to cool. Combine beef, cheese, cooked onions, ketchup, salt, pepper, and cornstarch. Mix with your hands until everything is evenly combined. Set aside. Remove dough from the bowl and give it a quick knead. Divide the dough into 16 equal portions. 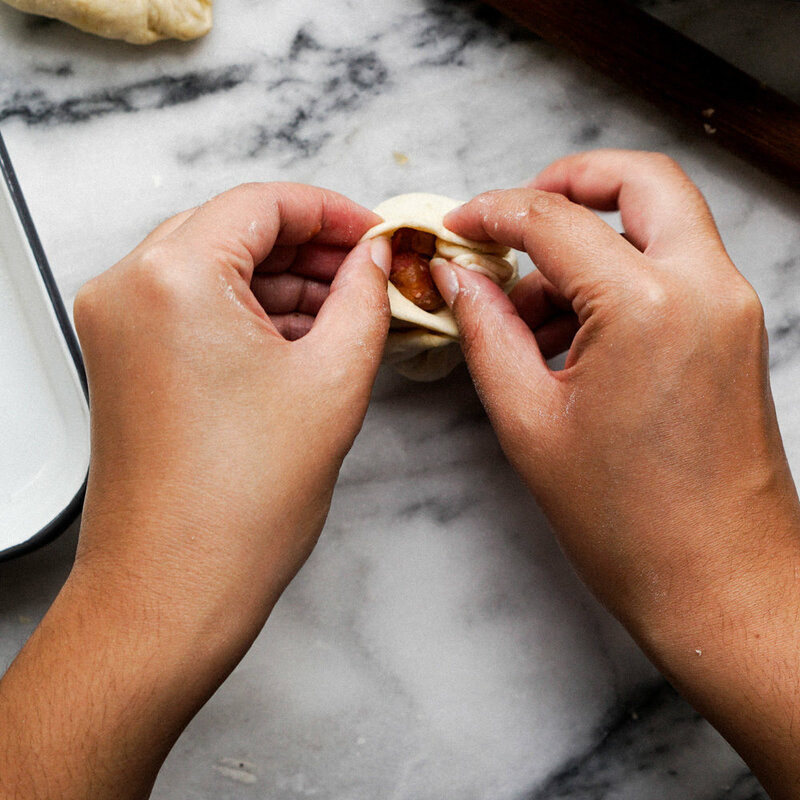 Roll out your portioned dough into a 4” circle. Place a heaping tbsp of filling into the center. Pinch the bun closed in a counterclockwise direction using your thumb and index finger. Or you can just pinch the whole thing closed in one motions. Place on a flour dusted tray and repeat with remaining bun. Heat up 1 tbsp of oil in a large pan with a fitted lid over medium high heat. When the oil is hot, add 8 buns into the pan pinch side up. It’s okay if they touch. Fry in the pan for 2 minutes until the bottoms are golden brown and crispy. Reduce the heat slightly to medium and carefully pour in 1/3 cup of water. It will spatter! Quickly cover the pan with a lid and steam the buns until the water has evaporated, about 8-9 minutes. Keep an eye on them so they don’t burn! Remove buns from the pan and repeat frying/steaming method with remaining buns. Enjoy immediately with ketchup and or soy sauce!